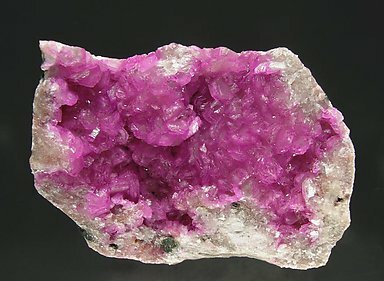 Aggregate, on matrix, of crystals that are very rich in faces with a predominant rhombohedron, between transparent and translucent, very bright and with an extraordinary color due to its liveliness and depth. 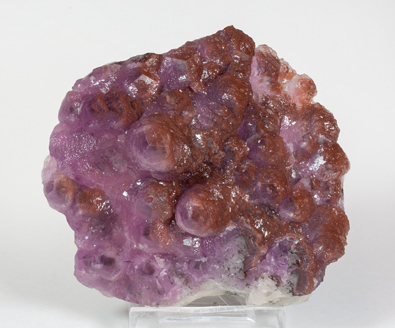 Botryoidal growths on matrix of Calcite (cobaltoan variety) with an intense and deep color with areas that have lighter shades. 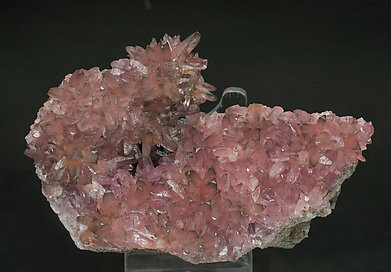 Botryoidal pale pink growths with recrystallized deep pink coralloid formations. We’ll send to the buyer the original label and also a copy of the computer card with the full text in the collection catalog. 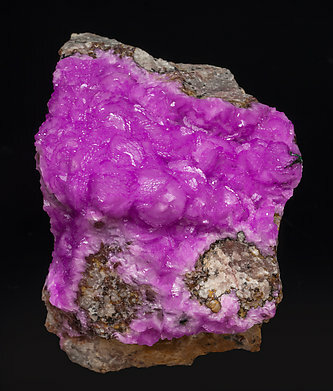 A matrix coated by Calcite (cobalt-rich variety) with an aspect clearly more crystalline than usual for the locality (a result, perhaps, of further recrystallization) and with a very intense color. 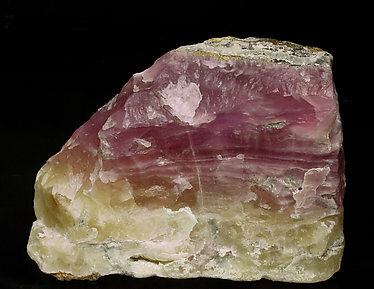 Banded growths of cobaltoan Calcite with a very intense color alternating with fine bands of white and yellowish Calcite. The sample, in spite its fine surface, hasn't been acid-etched, as its rough surfaces in most areas and the existence of easily altered carbonates proves. Druse, on matrix, of lenticular crystals with predominant flattened rhombohedra. They are translucent, very bright and with an extraordinary color due to its liveliness and depth. A novelty at St. Marie 2013 (because of the scalenohedral crystals). Druse, on matrix, of very acute scalenohedral crystals with rhombohedral terminations. 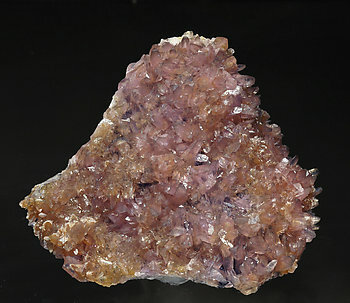 They are between transparent and translucent and have a color between deep pink and mauve, with a second generation of crystals with the same morphology, but with orange shades. The sample shows two different generations of cobaltoan Calcite, one of them with crystals having a very short prism with rhombohedral terminations and stalagmitic growths, and a second in which the crystals are slightly clear very well defined rhombohedrons with polycrystalline growths on their faces. 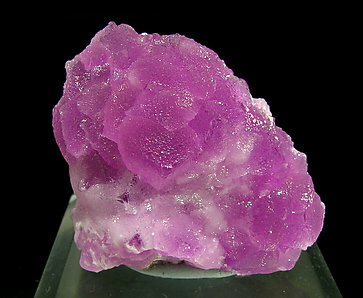 The color is very intense and the crystals have small black inclusions. A novelty at St. Marie 2013 (because of the scalenohedral crystals). 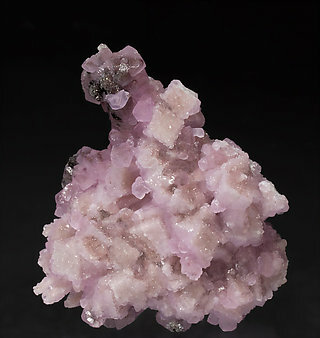 Aggregate, on Quartz matrix, of very acute scalenohedral crystals with rhombohedral terminations. 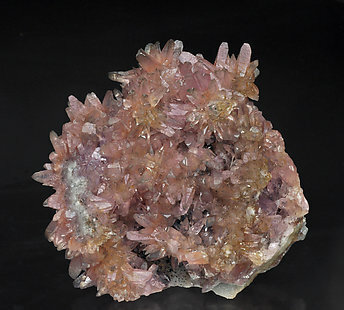 They are between transparent and translucent and have a color between deep pink and mauve, with a second generation of crystals with the same morphology, but with orange shades. Just as good as the photo suggests. 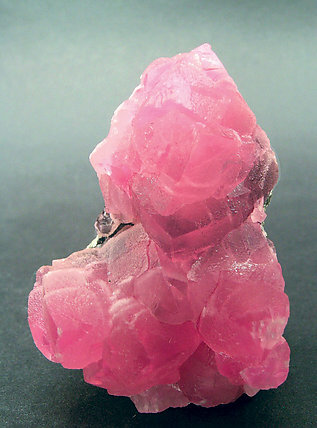 Intense pink color, huge crystals and an agreeable form. Definitive! 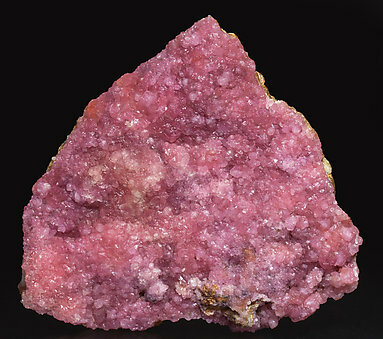 Group of crystals showing well defined rhombohedron terminal faces and excellent color, between mauve to pink. Group of rhombohedral crystals with curved faces and edges. 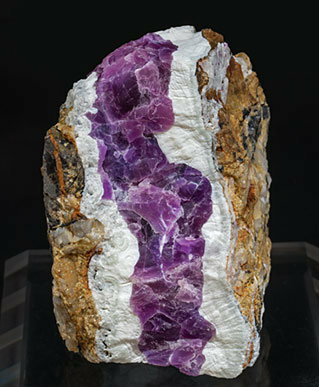 The luster is excellent but the mauve color is extraordinary, very deep and with beautiful shades and reflections. 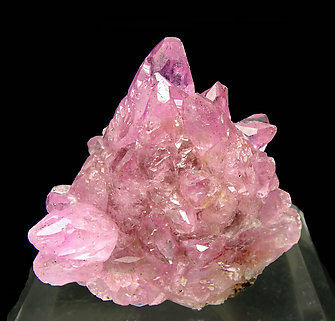 A group of scalenohedral crystals, very acute and very rich in accessory faces. 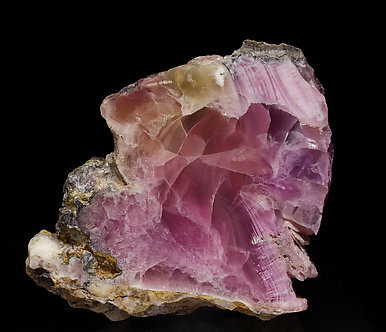 Really good transparency, perfect brilliance and intense pink to mauve color. Group of lenticular crystals with an especially intense color and luster. 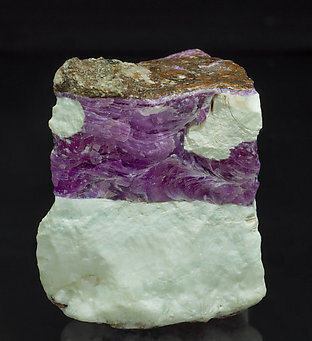 The base of the specimen is sawn but it doesn’t diminish the esthetic value of the specimen. The sample is with a card from the Folch collection (number 2052) that we'll send to the buyer. Fine banded growths that alternate bands of very intense and deep color contrasting with others that have a very pale color. As a rarity, we note the presence of a small geode with very acute cobaltoan Calcite crystals, very rare for the locality. 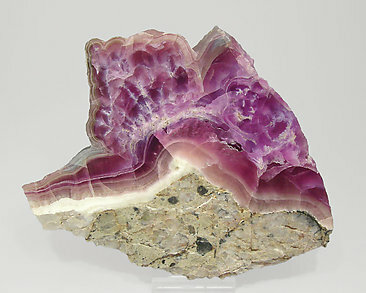 Translucent polished section with banded growths and nucleus of very intense color. 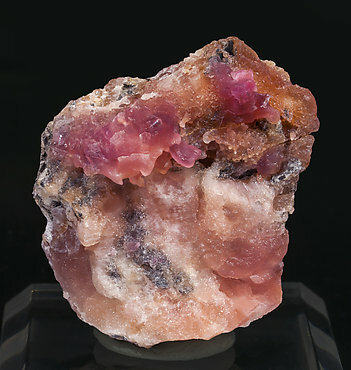 The sample has on some of its sides the original matrix that contrasts with the deep color of the Calcite. Polished section with concretionary growths with excellent color, very deep. 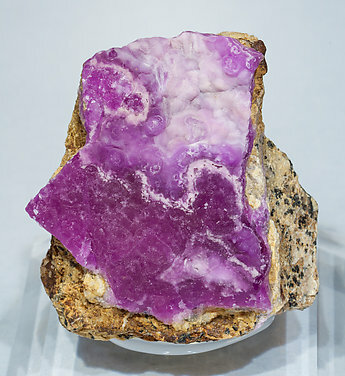 Though we don’t usually present polished samples, in this case we made an exception because of the unusual quality of the color of the Calcite and the collection of precedence, the mine (now totally abandoned and collapsed) was precisely exploited to obtain such pieces. 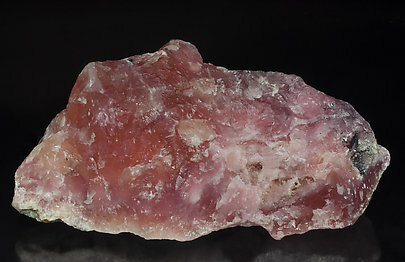 Cobaltoan Calcite core with a very intense and deep mallow color included in a very pale green banded Calcite whose color (variety zeiringite) is due to the presence of Aurichalcite inclusions. 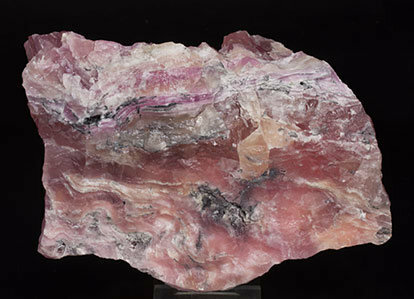 Banded growth of cobaltoan Calcite with a very intense color, between white Calcite bands. The sample, in spite its smooth surfaces, hasn't been acid-etched, as its rough surfaces in most other areas and the existence of easily altered carbonates proves. 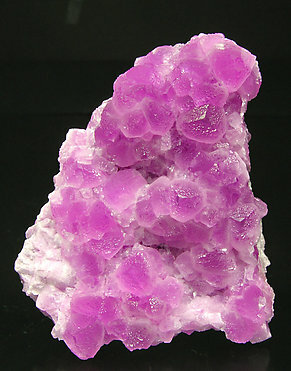 Botryoidal growths, on matrix, of translucent cobaltoan Calcite. It has a very uniform, intense and deep color and it is with yellowish globular growths of Calcite and thin surfaces of pale greenish Aurichalcite. 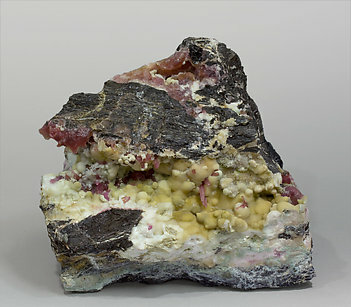 Irregular aggregate of crystals formed by a short prism with six faces and a flattened terminal rhombohedron, with vertical parallel growths all along the prism. 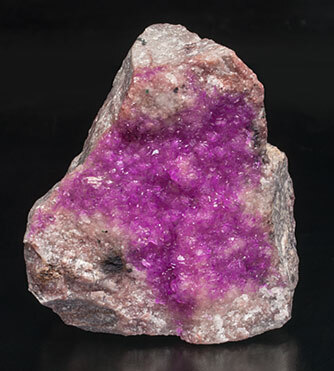 The crystals are bright and have a deep and uniform mauve color.